Who do I send a card to? Should I send a card to my co-workers? My motto is, if you send a card to one, send one to all. This is especially true if you are the boss. You shouldn’t play favorites. The alternative, sending just a few, is bound to backfire…someone will overhear someone else saying “What a nice card!” and wonder why they weren’t included. Of course if you work at a large company this isn’t very practical. Use your judgment and limit it to those you work with on a daily basis for example, or your immediate team. Christmas card etiquette suggests a more secular message, such as Happy Holidays, for the workplace. It’s nice to be able to order cards in smaller quantities so you have the flexibility to customize the message, change or add photos, etc., without additional costs. Do I send one to my boss? What about friends I haven’t seen in years? 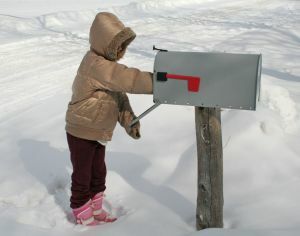 If you want to stay connected to a friend, send them a Christmas card. It’s that simple. Time and distance should not matter. We may lose touch with people, but thanks to Google and Facebook, no one is completely out of reach. Look them up and send them a Christmas card. Perhaps you will hear back, perhaps you won’t. Either way, there’s nothing wrong with spreading a little holiday cheer. Is there a right time to drop someone from the list? Some people never send a card back. Should I keep sending mine? Some people don’t do Christmas Cards. I have had a few years when I have been too busy and worried that I would offend people by not sending one. So I never assume that because I don’t get one, that mine won’t be well received. By this I mean families with whom we have a current relationship, but didn’t last year and probably won’t next year, such as the families on our son’s hockey team. For us this is an easy decision. We send one to everyone on the team, but feel no obligation to send one the following year, unless we continue the relationship. It’s also perfectly fine to send one to certain members and not others. Just remember, sending a card is a way to confirm or maintain a connection. It shouldn’t feel like an obligation. Will a Christmas card offend my non-Christian friends? A Christmas card can be religious, but it doesn’t have to be. The way I look at it, a card is a greeting. And a friend is a friend. I wouldn’t leave these friends off my list, but I do make sure to send a Happy Holidays message to them. Since I have gotten cards in return wishing me Happy Holidays or a Happy New Year, I am pretty sure they’re not offended by my greeting. On the other hand, many people feel strongly that Christmas is a religious holiday and would never send anything but a religious Christmas card. They limit their list to others who celebrate the holiday. It’s a matter of personal choice. I always send a “religious” card, My family and I are Christians, so my cards always reflect our faith. We send our Christmas cards with more than wishing them a happy holiday. What a perfect time to share not only a card, but the Good News that comes with the birth of Jesus! So whether to friends, co-workers, or family we share the same Christian Christmas card with all of them.